A new two-minute featurette explores Diana Prince of Themyscira's role in the Justice League. We've already seen the Cyborg promo sponsored by AT&T. Now it's time to spotlight Diana Prince aka Wonder Woman. 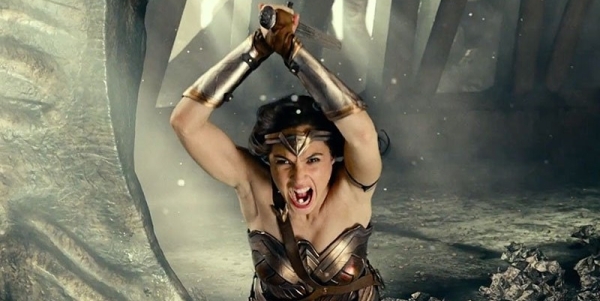 Gal Gadot who plays Wonder Woman describes her character as a "warrior of the Amazons. Daughter of Zeus and protector of the world". Justice League Promo - "Wonder Woman: Exclusive First Look by AT&T"
"She grew up isolated from the world of men," Gadot says, "She's super smart, super sophisticated, full of hope." Interestingly Gal Gadot has confirmed that, even though Justice League takes place after Batman v Superman: Dawn of Justice the character is much more optimistic than that movie showed her to be. In Batman v Superman she told Bruce Wayne (Ben Affleck) that "100 years ago, I walked away from mankind." Wonder Woman showed her much more optimistic and showed that she would never walk away from humanity. So what changed? In a recent press tour Gal Gadot confirmed that the character has been changed from Batman V Superman's bleaker vision to one of hope. "We realized that actually, there is no way that Wonder Woman will ever give up on mankind," Gadot says. "The reason why she left the island was because she wanted to make their life better and safer – they are her calling. So – I’m giving you a very honest answer – sometimes, in a creative process, you establish something that is not necessarily the right decision, but then you can always correct it and change it. So Wonder Woman will always be there as far as she concerns for mankind." In the promo Gadot also describes Wonder Woman as "the most talented warrior but at the same time doesn’t care for the fame or the glory." Justice League's Wonder Woman costume looks just as amazing as in previous films as she stops a bank robbery, fights Steppenwolf and handles that sword like a boss. The relationship with Wonder Woman and Batman is also highlighted. "We're asking people we don’t know to risk their lives," Diana says. Bruce, walking away, says, "I know. This is how it works." The team is basically a group of loners, but Wonder Woman helps make them united. Wonder Woman's love and compassion is what makes her an amazing superhero and Gadot knows it. She says Wonder Woman is "this glue to the team. She makes each and everyone one of them feel stronger and capable." It's another awesome look at the team and really gets us hyped for the upcoming movie! What do you think of the promo? Are you excited for Justice League? She did say she walked away in that film. After Wonder Woman, she's right - she never would. And she's the heart of the team. She's definitely the strongest, at least until Superman comes back. Kind of funny that her and Batman are sort of having a thing when in comics a couple years back it was her and Superman with the romantic fling. Anyway, I'm looking forward to seeing it on my birthday as a gift to myself.